Expressing confidence that BJP would throw several surprises in Bengal, state BJP president Dilip Ghosh said if the saffron party wins the Lok Sabha polls in West Bengal, the ruling TMC would not be able to complete its full term and the state will go for fresh elections by the end of this year. Noting that Bengal is standing at the crossroads of a change, Ghosh said the election in Bengal would be between national forces like BJP and "anti-nationalist forces like TMC". He also said if BJP wins the Lok Sabha polls in the state then it would take action against "illegal madrasas at the Indo-Bangla border as these madrasas are cradle of anti-national and terror activities". Hinting that the TMC government in the state won't complete its full term till 2021, Ghosh said the state might witness assembly election by the end of 2019 as several TMC leaders and elected representatives might abandon the "drowning ship of TMC". "West Bengal is standing at a crossroads. This will be a semi-final before the final assault to remove this corrupt TMC government. People are eagerly waiting for a change to take place in Bengal. Our central leadership has also given us a target of 23 out of 42 seats and we are working towards it. We are fully confident of not only achieving that target but also winning more than that," Ghosh told PTI. The TMC and BJP are engaged in bitter battle of Bengal in the ongoing general election. Bengal sends a total of 42 members to Lok Sabha, the third largest after Uttar Pradesh's 80 and Maharashtra 48. "You might see a fresh assembly election by the end of this year (2019) or by early next year. This TMC government won't complete full term. 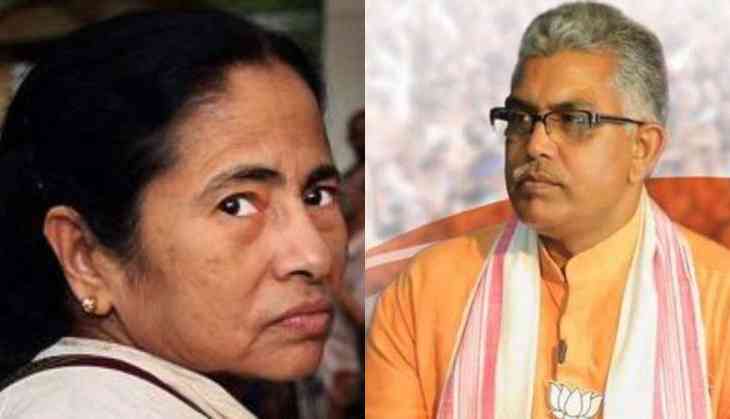 There are several top leaders of TMC and elected representatives who are in regular touch with us and are waiting to crossover to BJP," Ghosh said. While speaking on the poll planks on which the party will be fighting the polls in the state, Ghosh a first time MLA from Kharagpur assembly, said infiltration, implementation of NRC, Citizenship (Amendment) Bill and closure of illegal Madrasas at bordering areas will be major issues on which the party will stress during its campaign. "Our stand is clear we want NRC and Citizenship (Amendment) Bill in Bengal, as we want infiltrators to be driven out. If we win we will raise the demand in Parliament. Mamata Banerjee in order to secure its minority vote bank might try to convert Bengal into a guest house (dharmashala) but we would never allow to do that," he said. "If BJP wins in Bengal it would work towards closure illegal madrasas operating along Indo-Bangla border as these are a breeding ground of terrorism and anti-national activities in the country", the 54-year-old BJP leader said. "We don't have problem with legal Madrasas. We all know that most of the illegal madrasas in bordering areas are breeding ground of anti-national elements and terror activities. These madrasas has to be closed immediately and we will work towards it. The TMC is trying to protect these Madrasas to secure its vote bank," Ghosh, who himself is fighting from Midnapore Lok Sabha seat said. While speaking on the ongoing protests over BJP's candidate selection in the state, Ghosh said tickets have been given on the basis of the "winning ability" of the candidates. "Yes there might be some grievances but that doesn't mean that someone can just disobey the party directives. The tickets have been given on the basis of winability of the candidates. We have taken those who can win the elections. Just because someone is in the party for several decades doesn't mean that he or she will get ticket. If everybody contest Lok Sabha polls then who will fight in assembly, municipal and panchayat polls," Ghosh said. While justifying party's decision to give tickets to turncoats over old-timers and homegrown leaders, Ghosh said when someone from a different political outfit joins a new political party there are ought to be some grievances but at the end of the day every body has to abide by party's decision as BJP is a disciplined party. "For the first time in Bengal since Independence BJP is fighting the polls on the basis of its organisation and strength. Earlier, it was casual affair in the state as we neither had organisation nor presence in the state. So those who are protesting now why were they unable to win elections in the state for so many years?" he questioned. His comments comes in the backdrop of discontent brewing over ticket distribution after old-timers and homegrown leaders were overlooked in favour of turncoats and newcomers. Protests have erupted in various parts of the state over the issue with several leaders either resigning or becoming inactive during campaign. The BJP, which has announced candidates for 40 seats out of 42 in the state, has nominated 10 turncoats, who switched over from Congress, CPI(M) and TMC and has around 20 greenhorns. When questioned how would party justify taking TMC leaders into BJP's fold against whom BJP once had raised the allegations of corruption and hooliganism, Ghosh said the allegations were against TMC party. "We all know that TMC is run by on the directives of one and only Mamata Banerjee.I can ask a counter question those who have just joined BJP from TMC are being framed in several cases. Why these cases are filed now why weren't they filed before," he said.